nimki recipe | crisp bangla nimki | how to make nimki namkeen | maida snacks with detailed photo and video recipe. 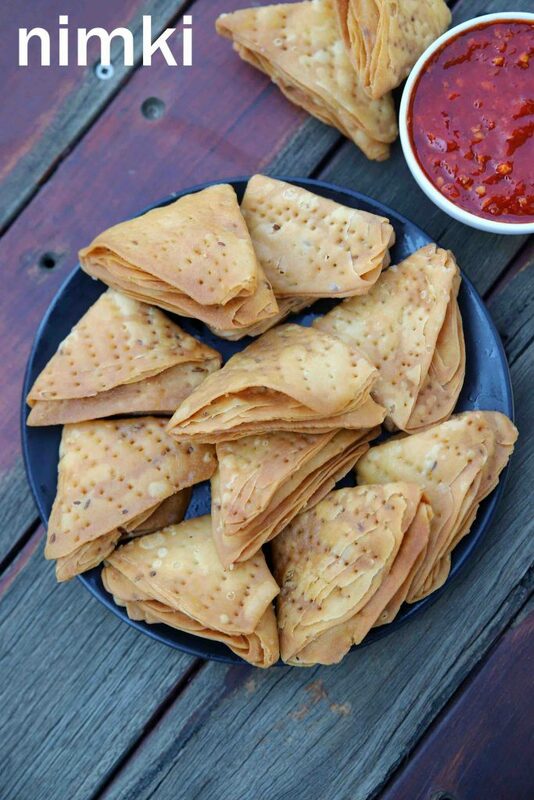 crisp and flaky flavoured snack recipe is made with plain flour and dry spices. it is an ideal evening deep fried snack and can be enjoyed with cup of tea or perhaps as a side dish to dal rice combo. nimki recipe | crisp bangla nimki | how to make nimki namkeen | maida snacks with detailed photo and video recipe. 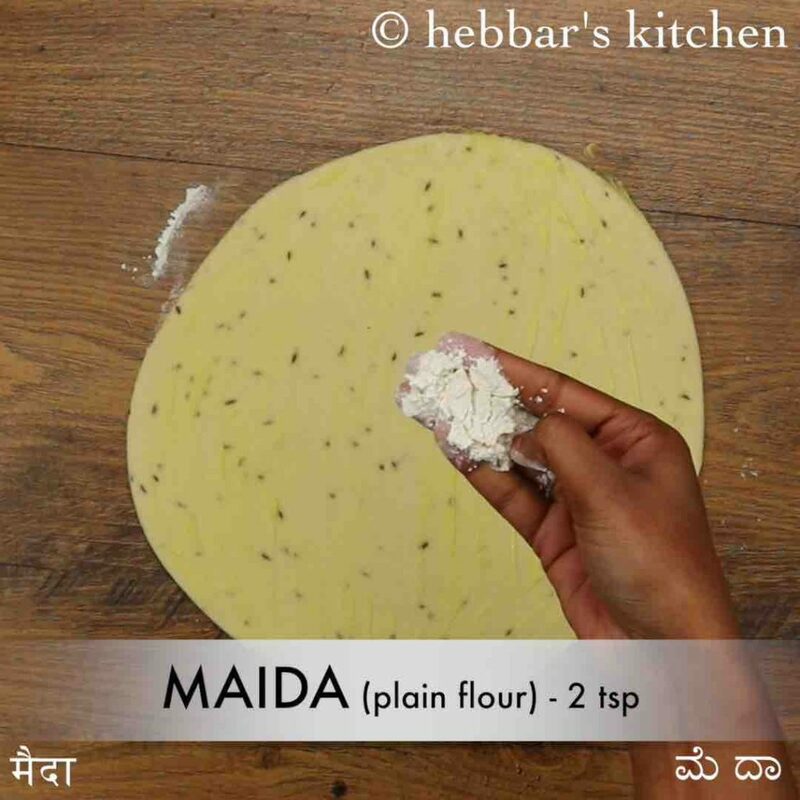 there numerous savoury snacks made from maida or all purpose flour across many regions of indian cuisine. the use case of these snacks differs and can be served as snack, or side dish or as a main ingredient for other dishes. one such easy and quick snack from bangla cuisine is crisp nimki served as both snack or side dish. 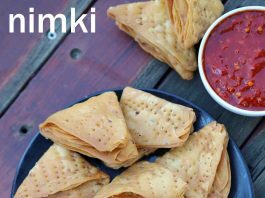 recently i have shared quite a few deep fried snacks recipe, but this recipe of crisp nimki recipe is my new favourite. there are primarily 2 reasons for my new choice. firstly, it’s due to the crispy and flaky texture this snack has to offer even after preserving it for weeks. typically, most of the deep fried snacks turn out to be crisp and eventually soggy after a while. 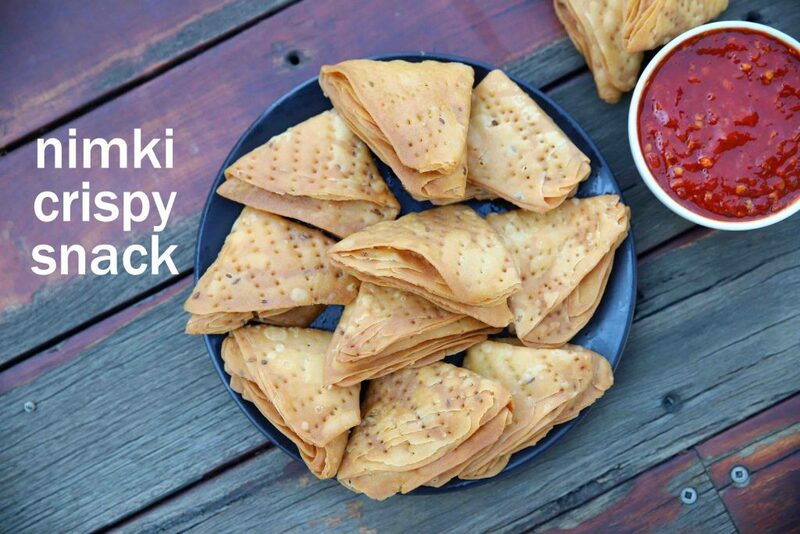 but this snack holds its shape tight and remains flaky easily. secondly, when it is compared to the simplicity, none can compare to this recipe. as i mentioned previously it is made with just 4 ingredients yet making a classic snacks recipe. 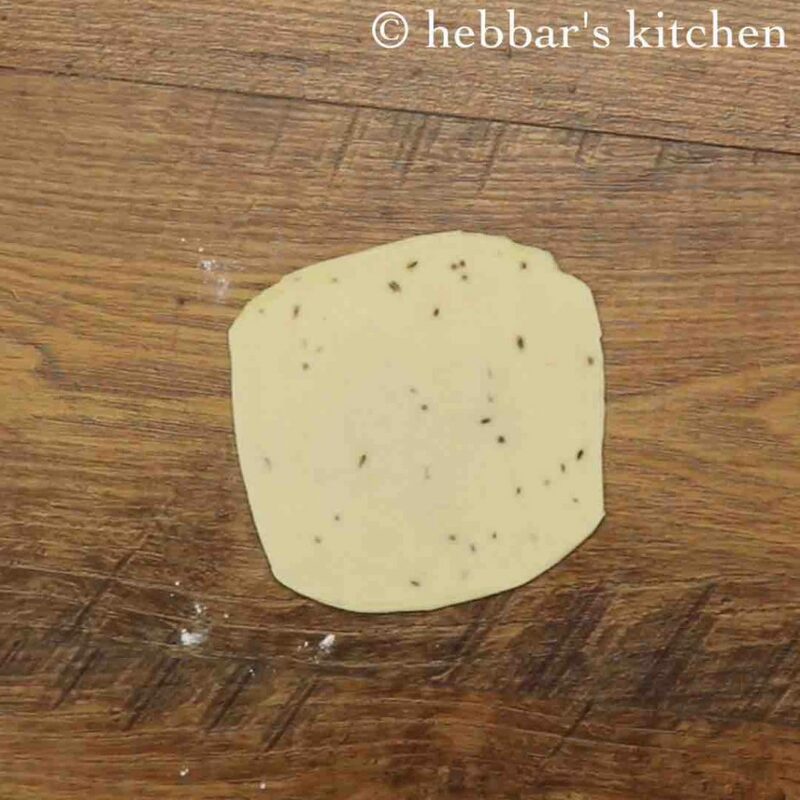 furthermore, some important tips and suggestions while making crisp bangla nimki recipe. 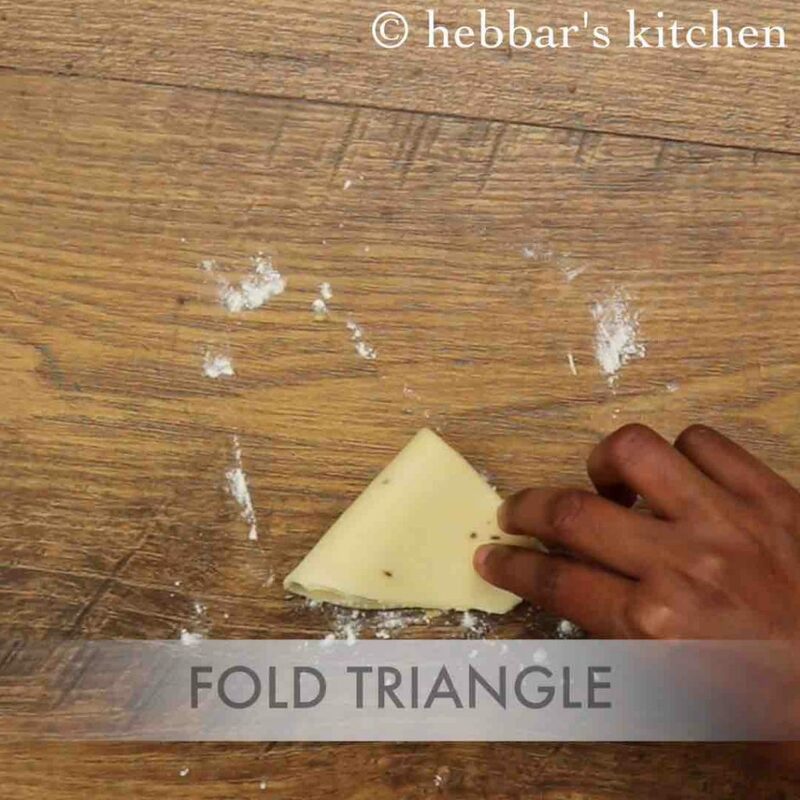 firstly, in this recipe, i have shaped this snack in a triangular shape which is a popular one for this snack. but can be shaped to any desired shape as per the preference or choice. secondly, i have not tried this recipe with wheat flour but can also be done with it. but my first preference would be always maida for a crisp and flaky texture. lastly, store these crisp snack in an airtight container for a better shelf life. also, do not deep fry these in high flame as it may not evenly cook. firstly, in a large mixing bowl take 2 cup maida. 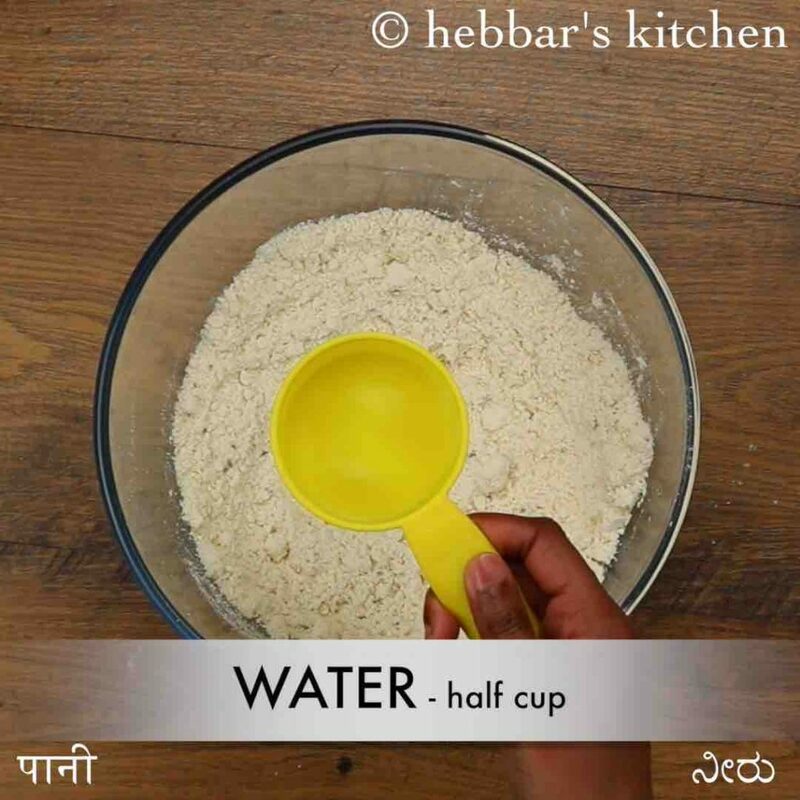 also add ½ tsp cumin, ½ tsp ajwain and ½ tsp salt. 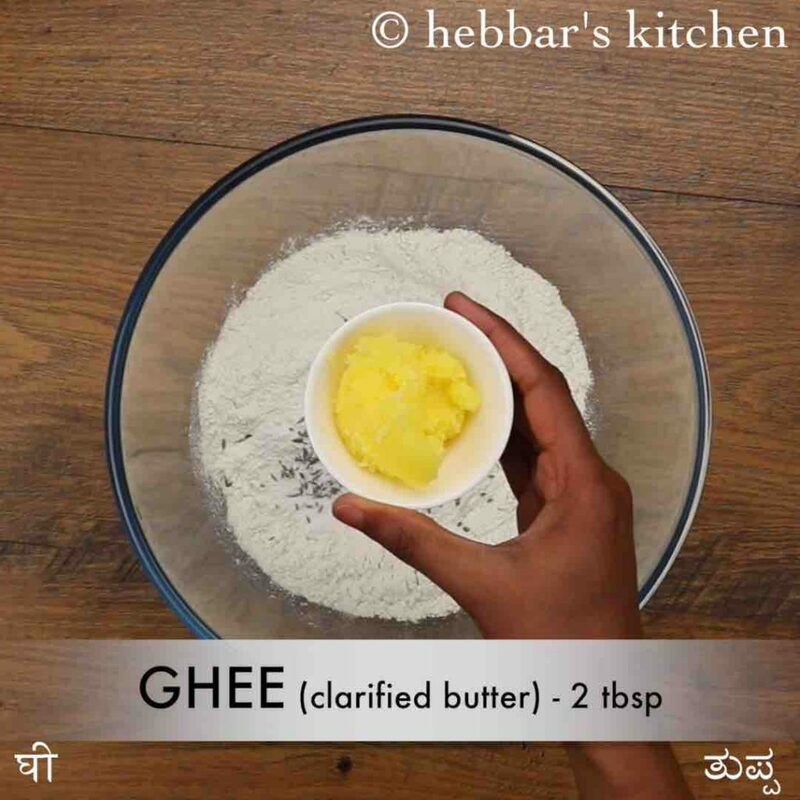 further add 2 tbsp ghee, crumble and mix well. 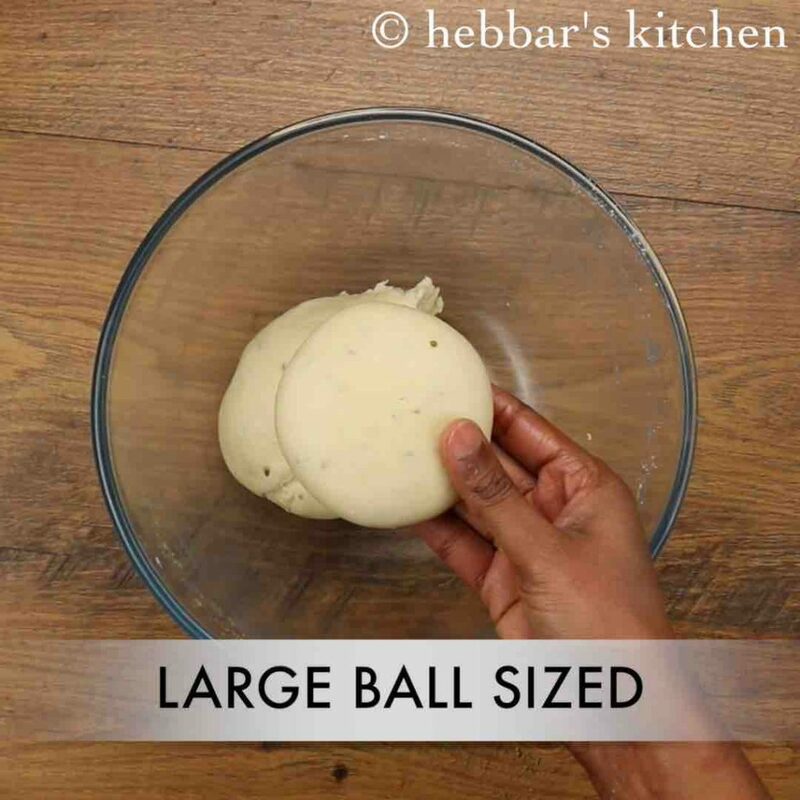 now add water as required and knead dough. 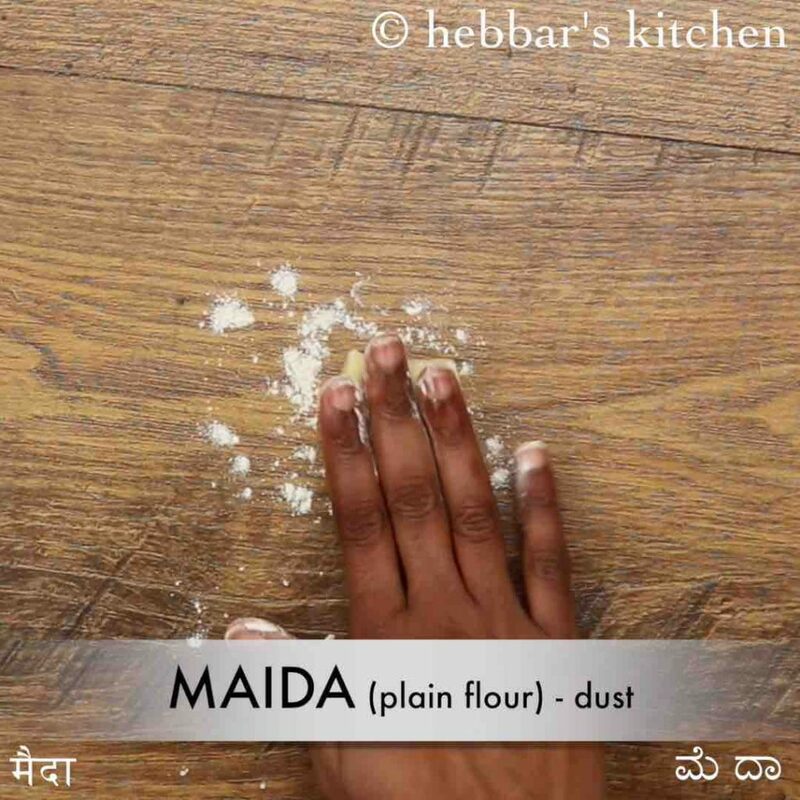 furthermore, pinch a large ball sized dough and dust with maida. 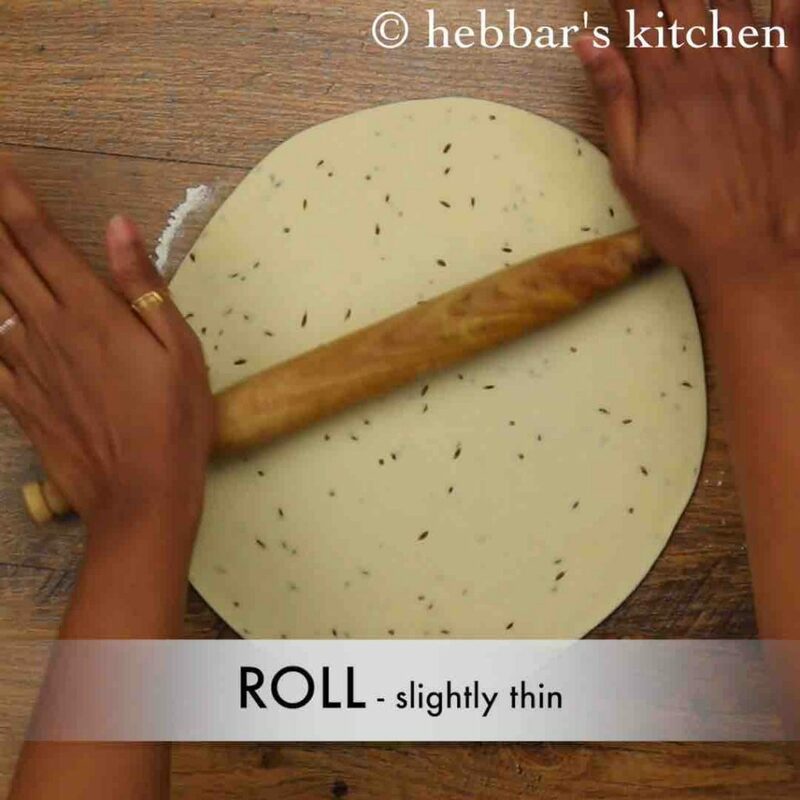 using a rolling pin roll slightly thin. 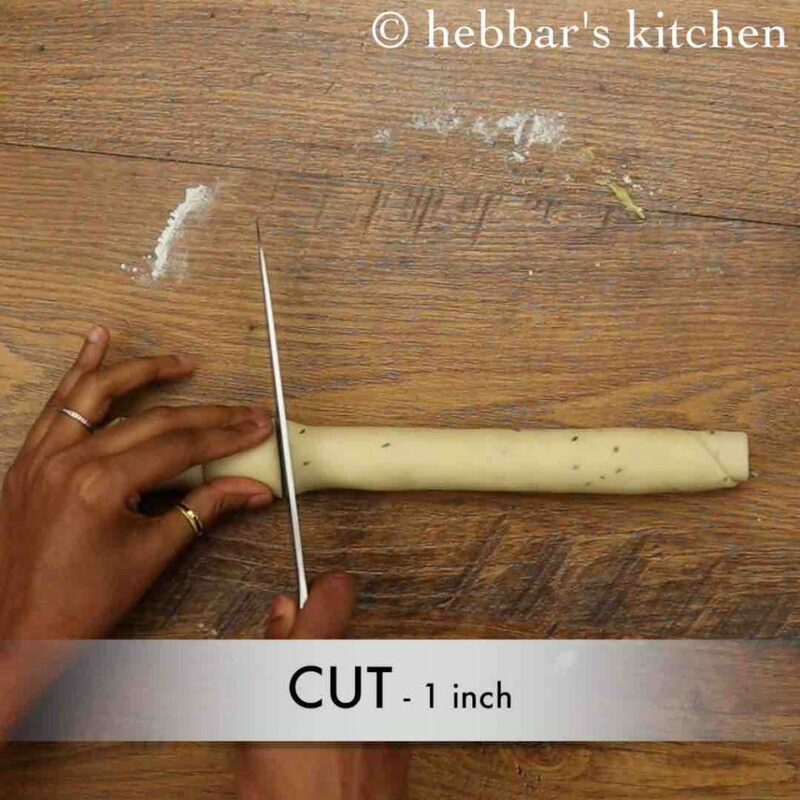 now rub ½ tsp of ghee over the rolled dough. also sprinkle 2 tsp maida and spread uniformly. 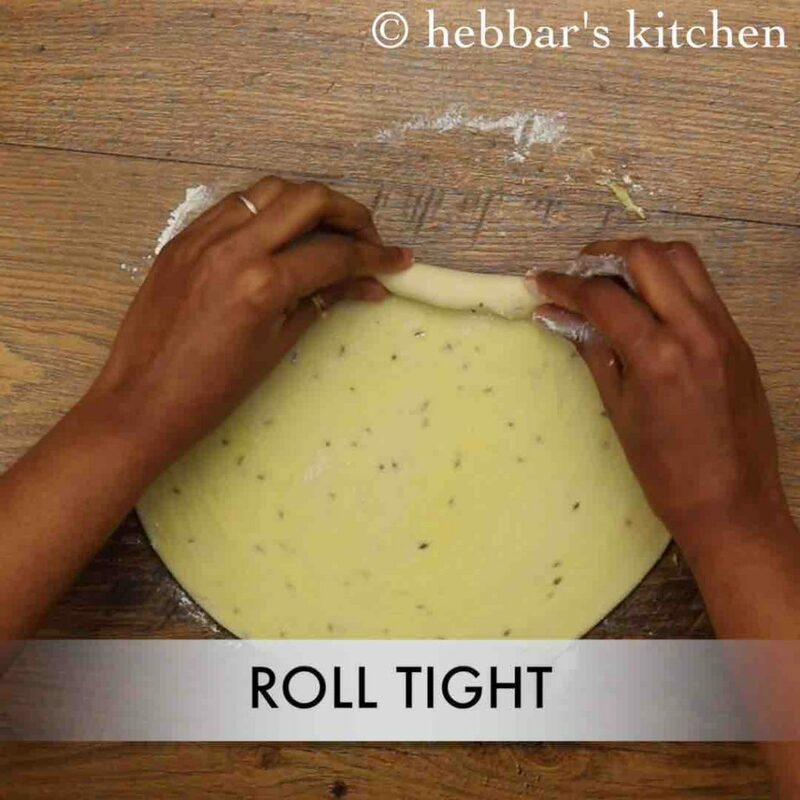 start rolling tight. this helps to get multiple layers in nimki. now cut 1 inch pieces and check for layers. press slightly and dust with maida. 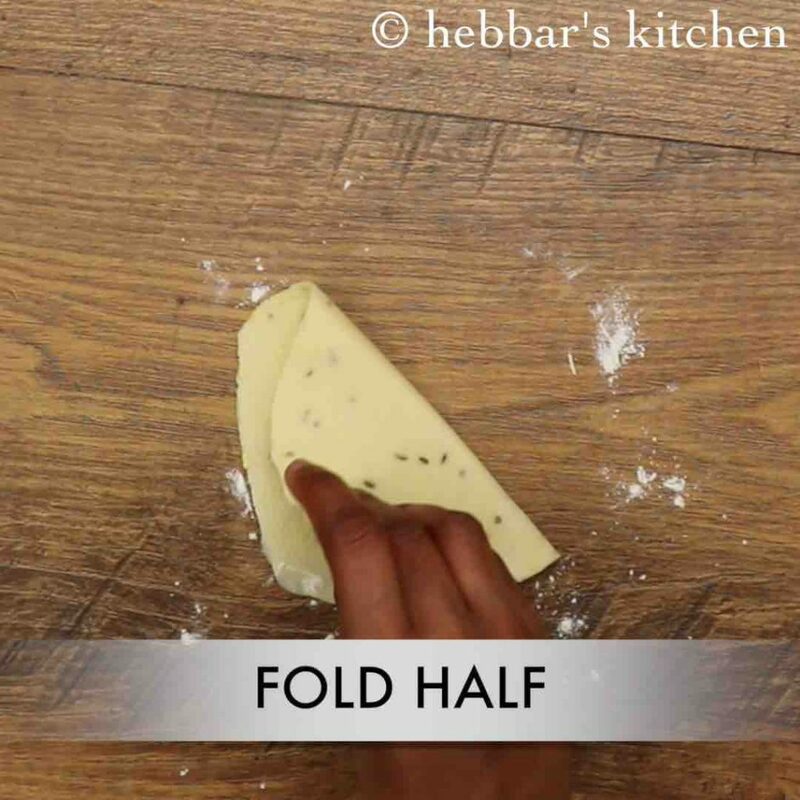 roll to rectangle or square shape and fold triangle. 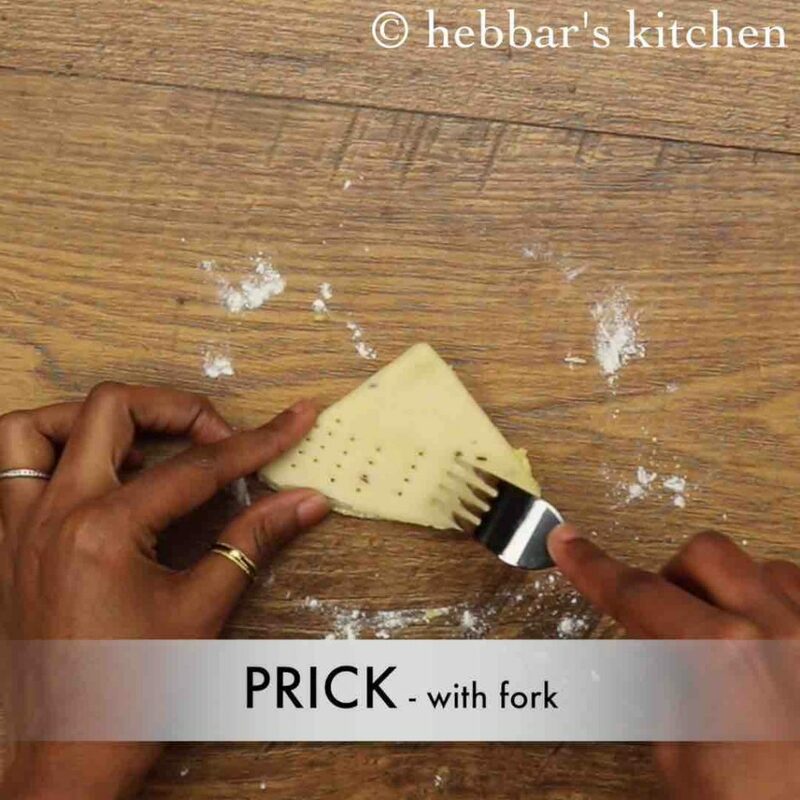 prick with a fork to prevent from puffing up while frying. 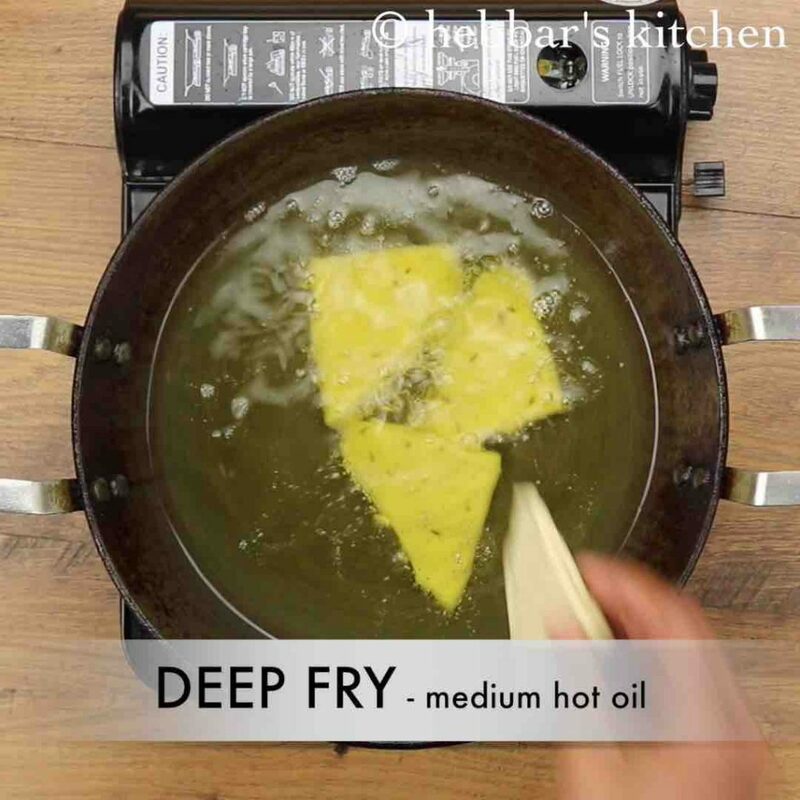 now deep fry in medium hot oil. finally, enjoy nimki as an evening tea time snack or store in an airtight container for at least 2 weeks. 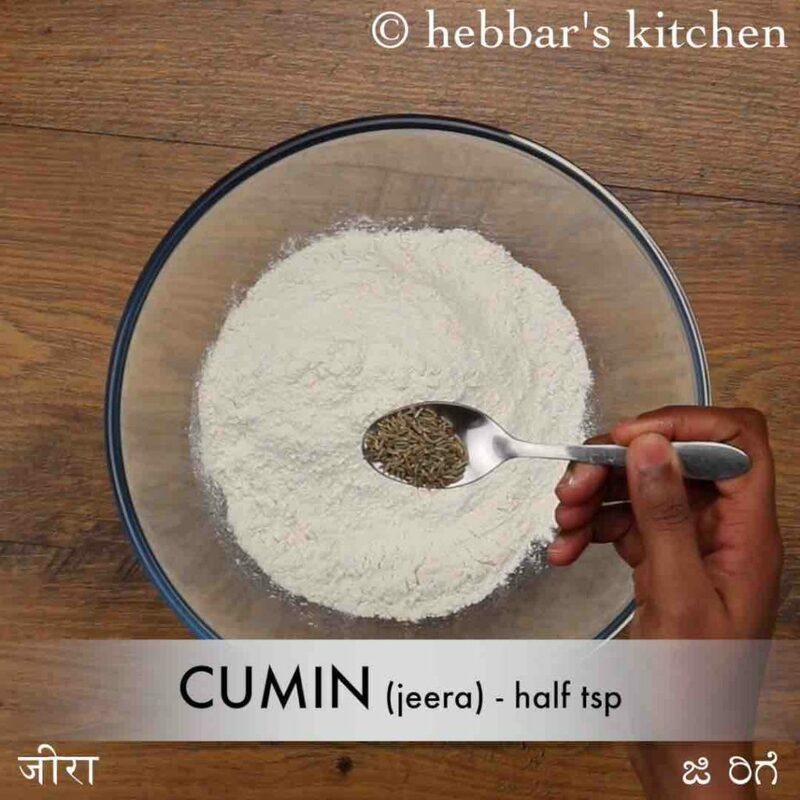 also, add ½ tsp cumin, ½ tsp ajwain and ½ tsp salt. alternatively, use onion seeds / kalonji seeds. 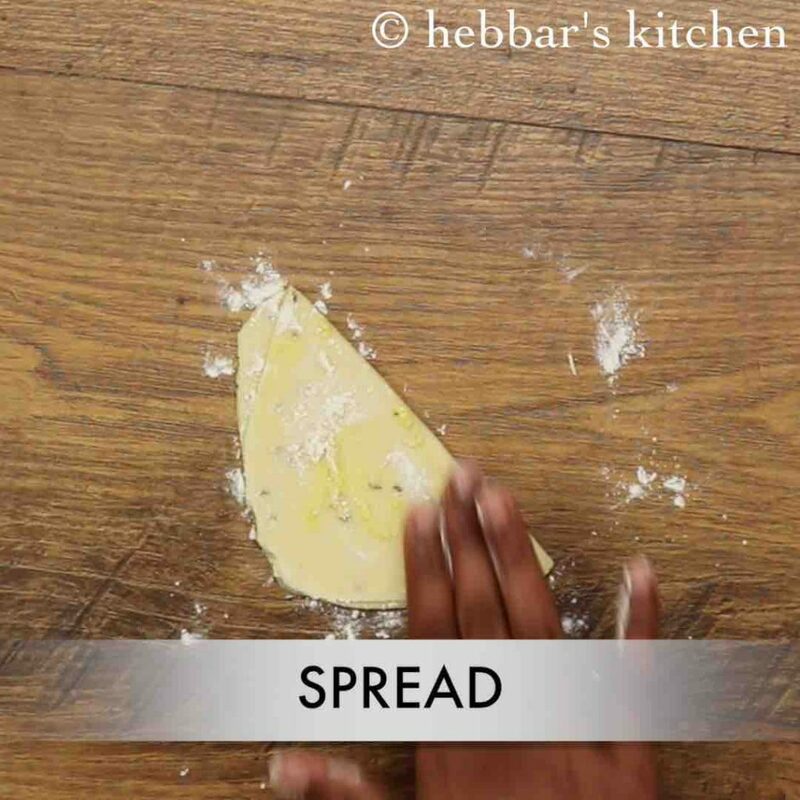 further, add 2 tbsp ghee, crumble and mix well making sure the dough is moist. need to hold the shape when pressed with a fist. 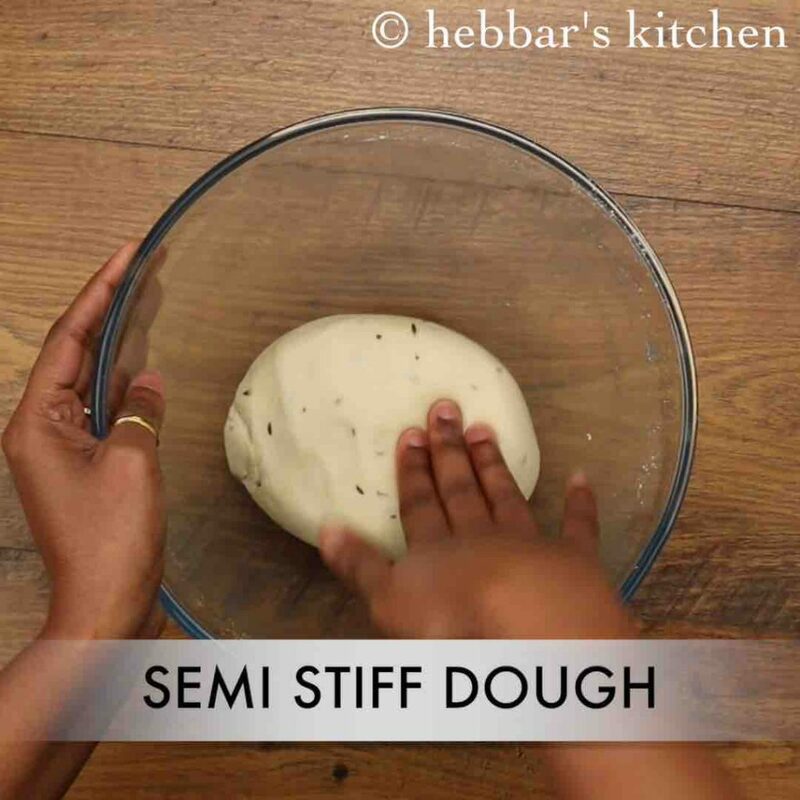 knead at least 5 minutes to a semi-stiff dough. also, sprinkle 2 tsp maida and spread uniformly. roll to a rectangle or square shape. 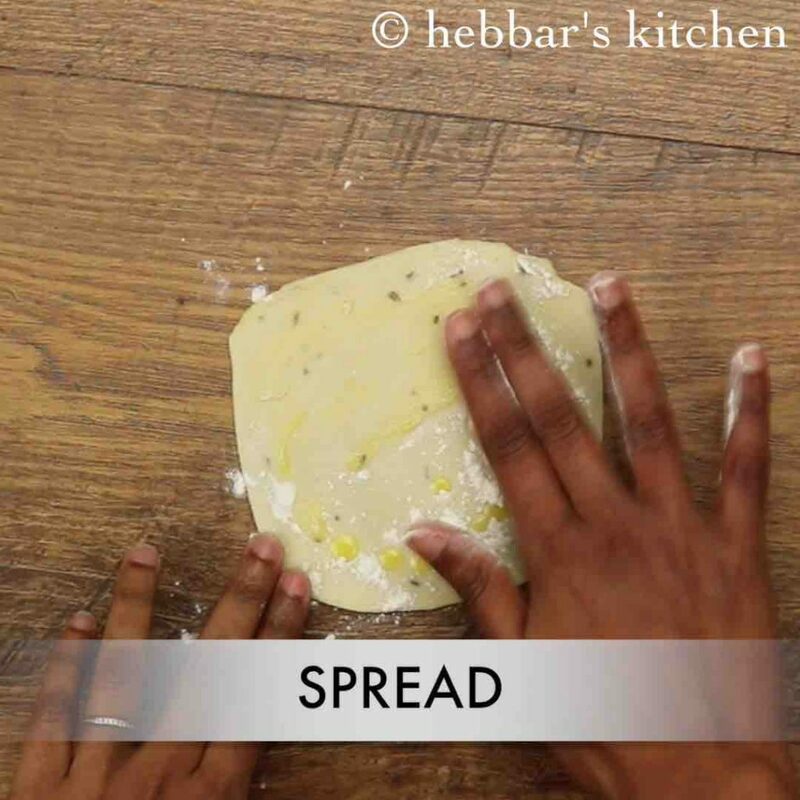 further, rub few drops ghee over the rolled dough. also, sprinkle little maida and spread uniformly. 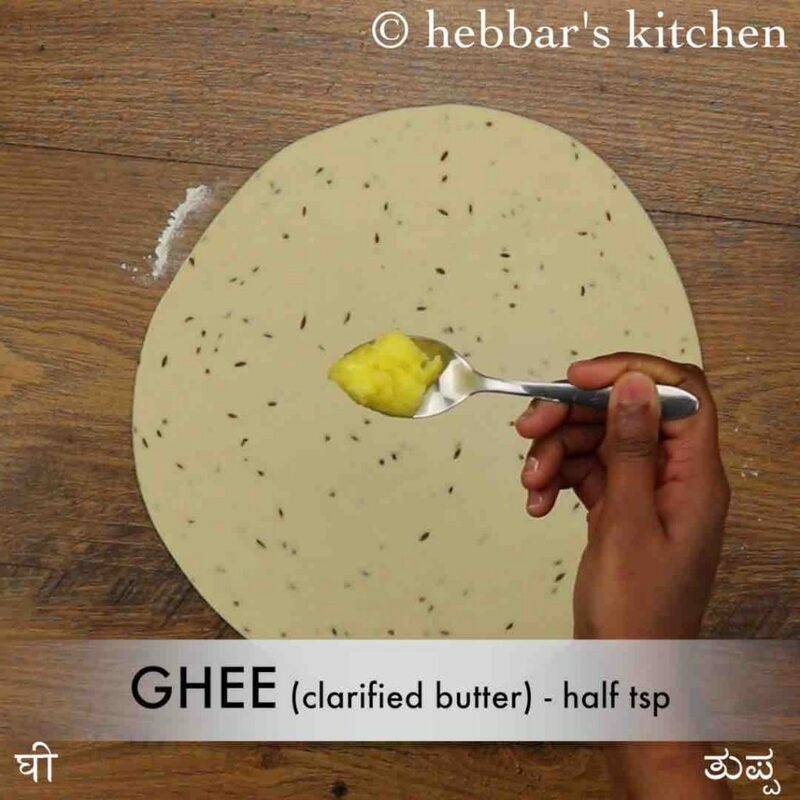 repeat rubbing ghee and spreading maida to get more flaky layers. fold triangle and press gently. do not put too much pressure, as layers will stick too each other then. 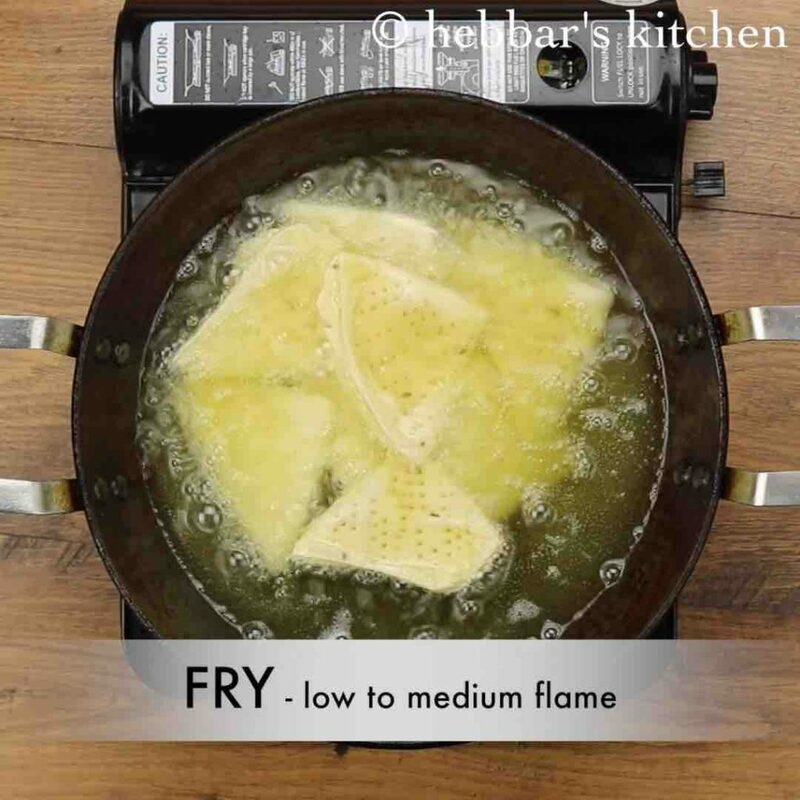 fry in low to medium flame until the nimki starts to float. 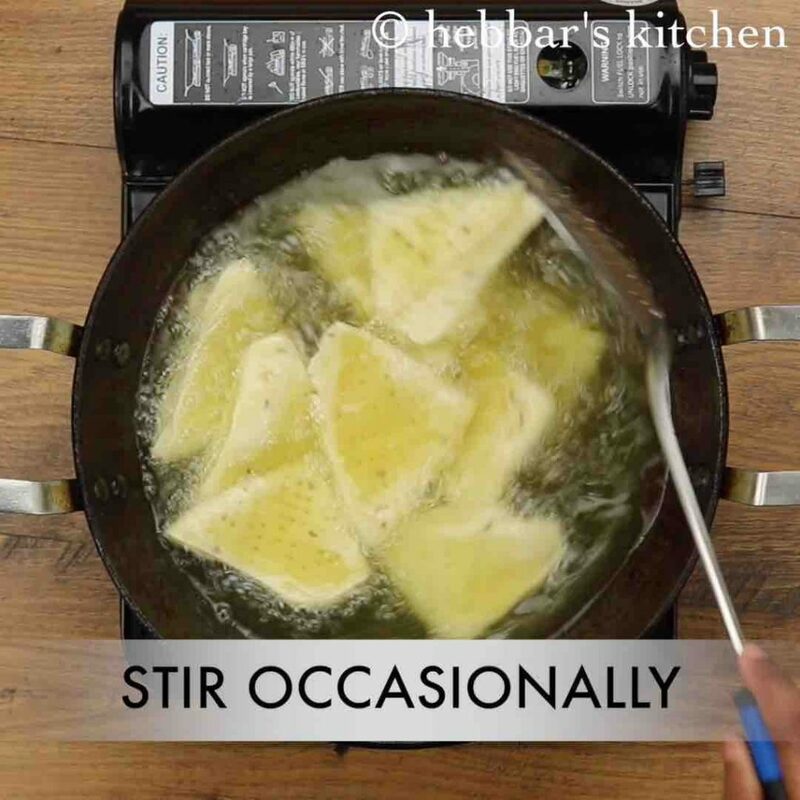 stir occasionally, and fry on both sides. 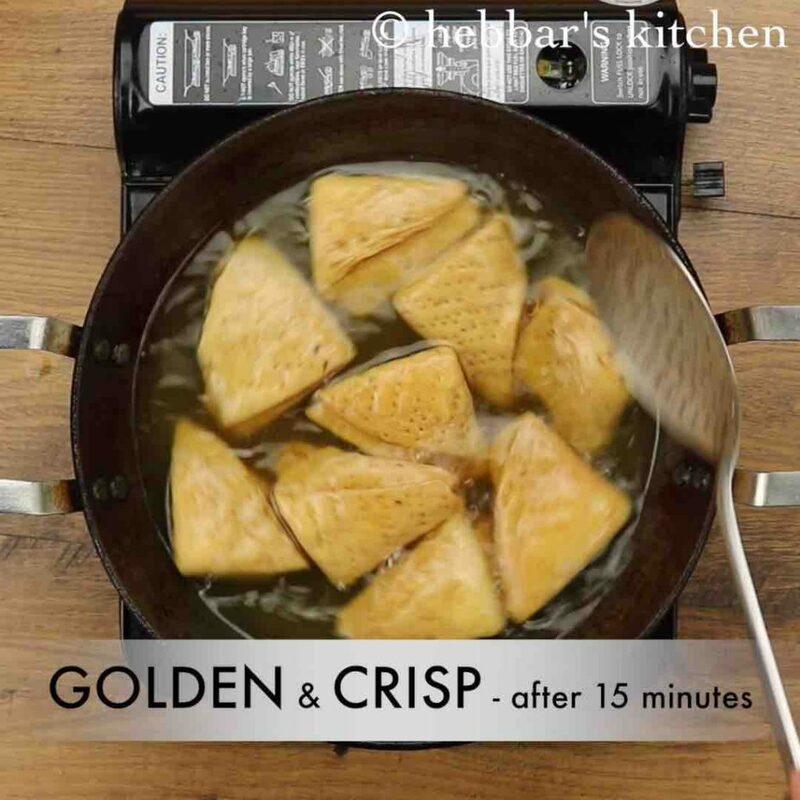 fry for at least 15-17 minutes, or until the nimki turns golden and crisp. 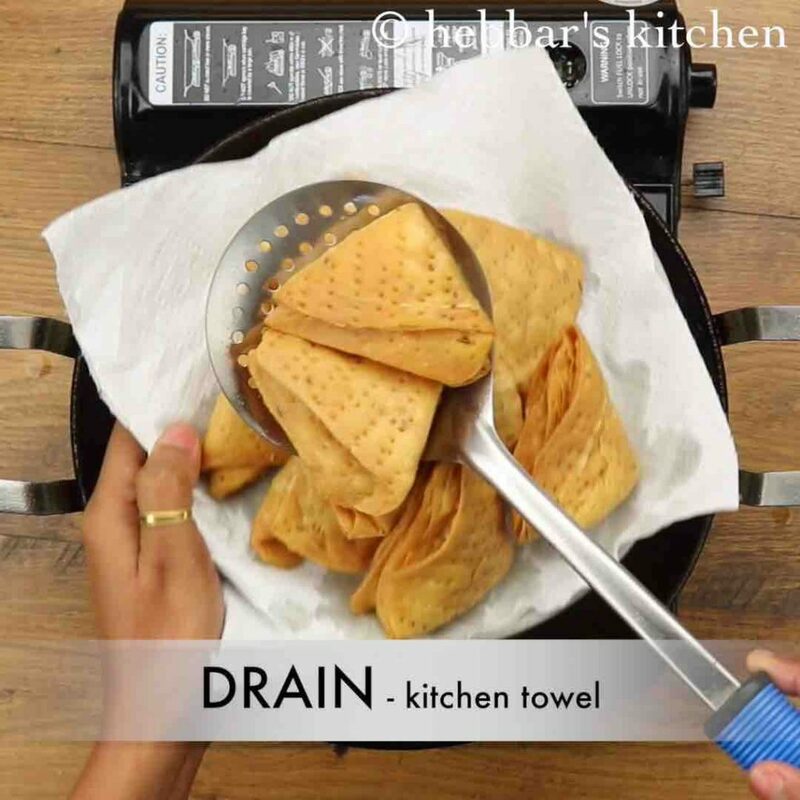 drain off the nimkis over kitchen paper. make sure to drain completely, as oil will be present between layers. 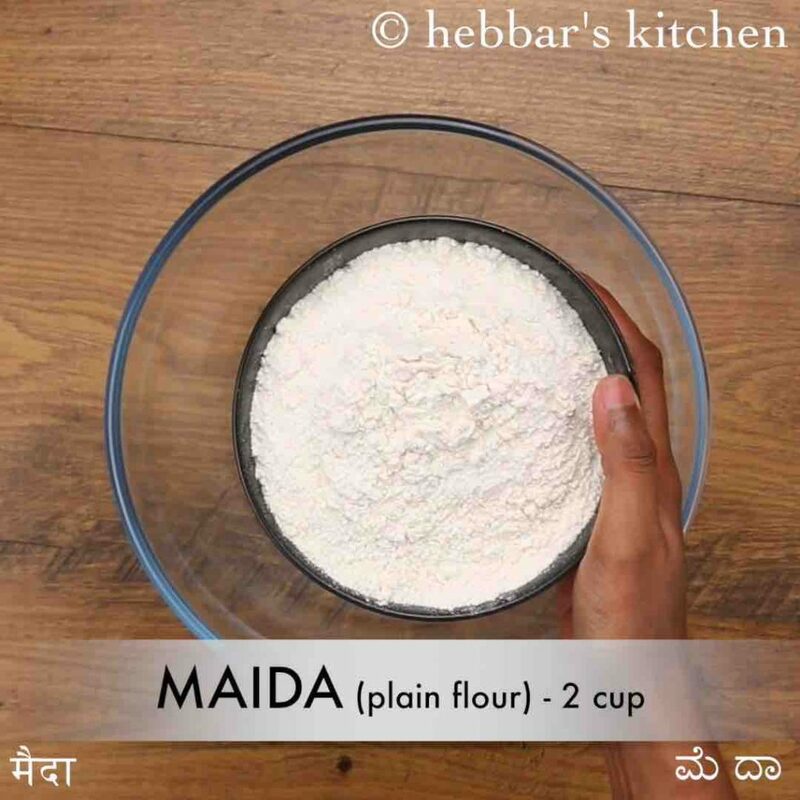 firstly, you can use wheat flour instead of maida, however, nimki turns more flaky and tasty with maida. also, rubbing ghee and maida helps to get crispy layers. 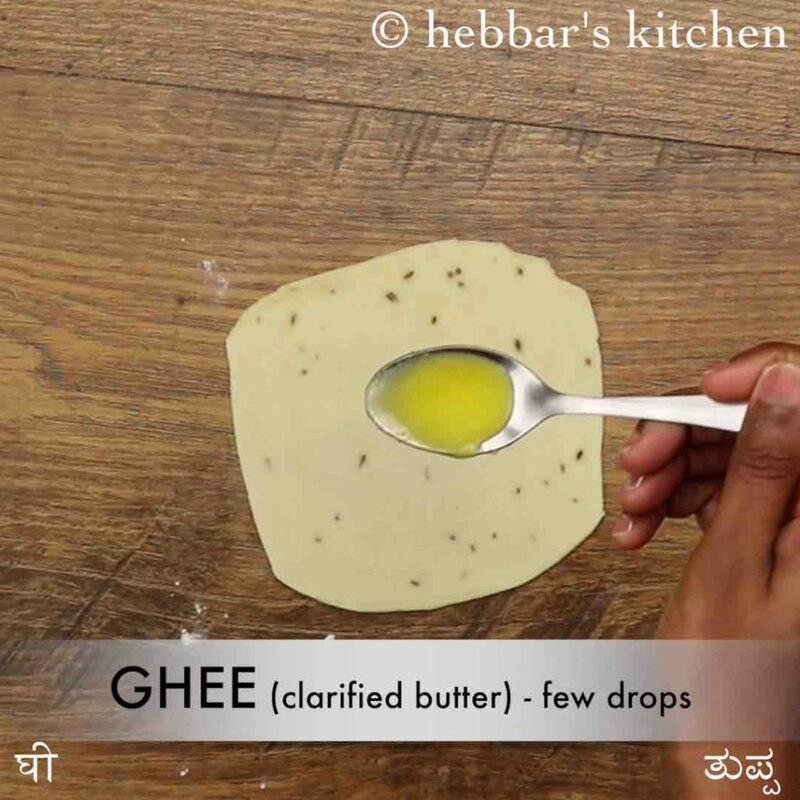 additionally, if you are vegan then replace ghee with oil. finally, nimki recipes taste great when prepared on low to medium flame.